Chop peppers length-wise into thick wedges, discarding the seeds and rib core. Place peppers in oven dish, drizzle with olive oil, season with salt, pepper, jerk seasoning and/or garlic powder and roast at 375 for at least 20 minutes. In the meantime, chop up the scallions and cube the mango into small bites. Make your rice. Warm up your can of black beans, seasoning with cumin, coriander, chili powder or whatever else you desire and stir in a hefty dollop of sour cream (as well as a little hot sauce). Add the mango to the finished beans. Make a bed of rice. Spoon the black beans into the center. 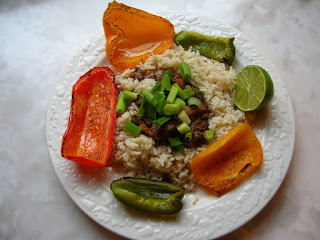 Add an assortment of peppers around the sides, sprinkle with scallions and give it a little squirt of lime. Not sure whether to credit Pacific or Caribbean influences, but it tasted as good as something tropical. And by picking a couple of peppers, it was just as easy to get fresh as it is after having too many of those paper umbrella drinks. of course your mama added hot sauce! sounds delish! There's a really good recipe in the vegetarian section of the newspaper this Wednesday that is somewhat similar. It's moutwatering also.